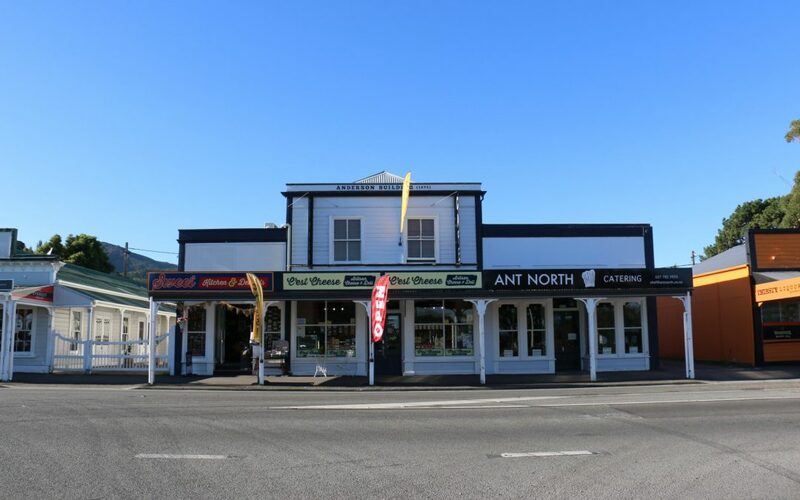 With niche shops popping up all over the place and a community filled with colourful, passionate characters, Featherston is skyrocketing into fashion. Events like Booktown, First Fridays, plus a property boom to boot, are putting the South Wairarapa town on the map. HAYLEY GASTMEIER reports. The Saturday fresh produce market kicked off last year and has since attracted people from all over the region. The Featherston Market is held behind Lang’s Pharmacy car park and features stalls by Wairarapa businesses, including the Pop-up Doggy Deli and Scotty’s Meats, Martinborough. Featherston sourdough master Martin Grice, who owns The Baker, says the market has added an energy to the weekend, and has also increased his customer base. But Featherston has “always been awesome,” he says. Having lived there for 14 years, Mr Grice has seen the town take off. “It started with Cornucopia, the cafe, and then Colonial Trading Company with boutique hardware came along . . . and then C’est Cheese and Everest started up. The monthly Featherston First Fridays event has also been a hit, uniting the region at the newly finished Town Square over art, picnics and music. The Royal Hotel is undergoing a steam punk facelift, with owner Rob Allen saying it will be reopening in the coming months. A new retail complex is in line for the empty section on Fitzherbert St, next to the Town Square. Developer Marcus Darley says, all going to plan, the complex will feature both retail stores and eateries. He is betting on it opening before the year is out. 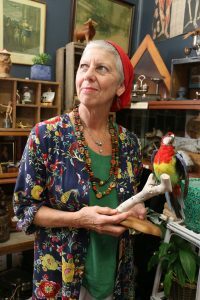 Mr Feather’s Den owner Sue Ryan says the name of her store, which is a mix of quirky items like taxidermy and Picasso inspired lampshades, is a play on the town’s name. “Featherston’s been thriving for some time now,” she says. She says many of the town’s residents had inspiring backgrounds, mentioning literary legend Joy Cowley, and James Cameron’s new centrally located wholesale depo, for distributing organic produce grown at Cameron Family Farms on Western Lake Rd. Adding to the culinary variety is new Italian deli, Sweet and Salty. As a small child, owner Elisa Romani remembers tucking into sultanas while sitting on top of flour sacks, hiding from adults in the storeroom of her great-grandfather’s flour mill. Well-travelled and with a background in human rights law, Ms Romani says she misses her career working alongside refugees. But her new path is reconnecting her to her roots. Now she is cooking up family-sized lasagnes and aubergine parmigiana for busy Featherston commuters to pick up after a long day. “I’ve been cooking since I was a child. You learn from your grandma, your uncle, your aunties. 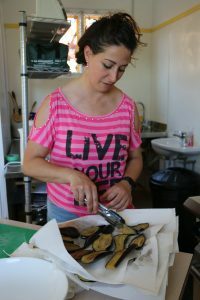 “You’re learning to cook all your life, that’s just what you do,” she says, recalling Cerreto Laziale, where she was raised near Rome. Since opening the deli, her panna cotta and cannelloni with spinach and ricotta have been hits. Add pizza, tarts, and bread to that list. 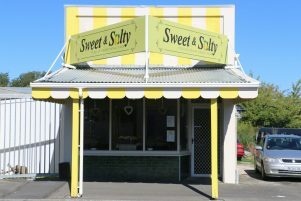 Sweet and Salty is open Monday, Tuesday and Friday, from 4pm to 7pm, and 10am to 4pm in the weekends. With three dedicated bookshops and the addition of Booktown (May 12-14), Featherston is on track to becoming Wairarapa’s literary hub. And at cafe Loco, books and coffee go hand in hand. 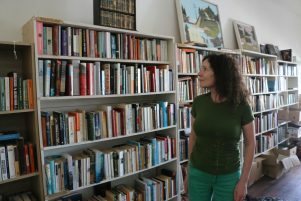 Recently purchased by former RNZ concert programmer and Booktown director Kate Mead, Loco has expanded to accommodate… well… more books. The cafe is open seven days a week and even when it is closed books are on offer. “There’s a free book exchange at the back, and afterhours kids can access free books from the box at the front of the shop. “It’s really well used,” she says, adding that last week she filled it with the complete works of William Shakespeare. Ms Mead is in the process of applying for a liquor licence, and has young musicians lining up to play for the customers. She hopes to hold weekend book readings for children. 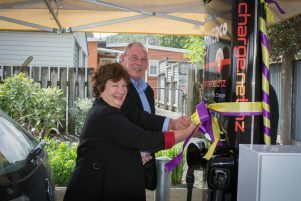 Ms Mead says the electric vehicle charger in the SuperValue carpark has led to new visitors. 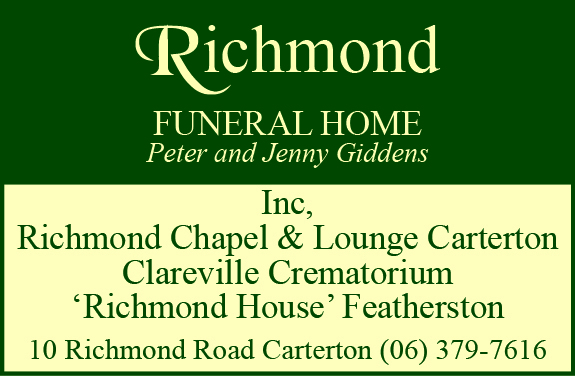 Her husband Ross Vickery says when he first moved to Featherston “to the untrained eye it didn’t look like there was much going on”. “What surprised us was the number of groups of dedicated, nice, long-term residents who were doing things in in committee and individually to enhance the town. 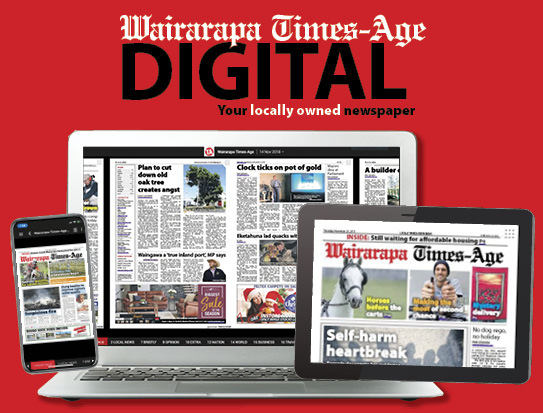 South Wairarapa Mayor Viv Napier said the town was “flourishing”. Mrs Napier said the recent commemoration of the “Featherston incident” had seen a great turnout, and watching the community come together for the makeover of the Featherston Heritage Museum was “amazing”. “I have visited Featherston School, the roll is increasing and they are doing great things with their kids. “And I’m told that it is very hard to get houses to buy and rent. “The people moving here are moving here to live. Real estate agent Erin Nesdale, of Property Brokers, says the town is booming. Ms Nesdale says house prices are “continually going up” and the number of buyers outweighs the listings. She is “continually bombarded” with new buyers, the majority of which are from Wellington. “They’re just getting bigger bang for their buck over here. She is also selling properties to the odd Auckland investor or Aussie buyer. Ms Nesdale says Featherston’s “rapidly expanding” commercial hub is increasing the town’s vibrancy. An example of this is gift and collectables store Dandelion, which has moved from its main street premises to a larger space on Fox St to allow expansion into a gallery and cafe. Thanks for the great article about Featherston Hayley / WTA! Been meaning to ask if you can come back and do a ‘part 2’ of the Featherston feature to include the awesome stuff happening at the eastern end of the main street – Featherston Library (free Wi-Fi); Featherston Information Centre; Featherston Heritage Museum; the Fell Engine Museum; Featherston Barber; BJ Autos Mechanics; Town and Country Fish and Chips and Lunch Bar; Creative Image Hair Studio; Vintage Clothing; Marsden Antiques; Messines Military History Bookshop; Dandelion Coffee, Jewelry, Gifts and soon to be Gallery; Quirks Antiques, Recycled Interiors and Party Hire; Monsieur Fox Vintage, Retro and Industrial Interiors; and For the Love of BOOKS (arguably the biggest -and some say best- second-hand bookshop in the Wairarapa) ? Very positive article , Wgtn Professional Fashion Industry Resident also moving over , excited. Brave and talented team at the WTA – thanks for believing in our town, its community and individual endeavours. It gives us such a boost to have your support as we try to do the best for and by each other. Yeh but feddyhole is still the gang capital of New Zealand.